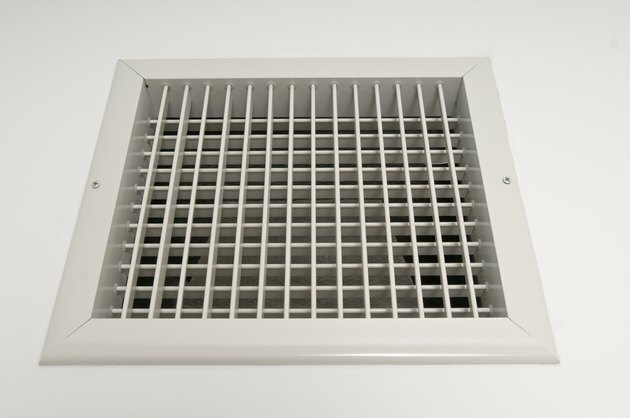 The sounds you hear from your vent can have many causes, depending on the sound and your type of furnace. A large range of sounds suggests furnace problems, some of which are minor and easy to fix whereas others are more complicated and may require professional help. Some sounds indicate dangerous problems and should be addressed promptly. Odd noises from heating vents are symptoms of a problem. A buzzing or humming sound usually means something is loose and needs to be tightened. It could be on the transformer mounting, the burner or the blower. If you hear a clicking sound after the blower shuts off, gas could be leaking from a valve. If your gas furnace makes a clicking sound followed by a humming noise when you turn it off, the sound is coming from a dirty flame sensor, or your control module is bad. A fan in a forced-air furnace pushes air through your vents. A mild grinding, groaning or moaning noise usually means the belt that runs the blower fan is out of alignment or worn out. It's also possible the bearings of the motor have gone bad. If your gas furnace howls loudly when it kicks on, insert a long lighter into the burner ports to see whether the flame "wanders" when the fan is on. If it does, the heat exchanger is cracked. A loud humming noise from a forced-air electric furnace is likely caused by something loose in the duct work. Rattling noises are sometimes made by loose cover panels. If you hear a loud rattling that sounds like a vibrating water pipe before the blower kicks in, there may be a crack in your heat exchanger. If it does have a crack, carbon monoxide could leak into your duct work. A dirty burner could cause your gas furnace to make a roaring sound. When the burner doesn't light properly, a flame shoots all the way to the hole where the gas and air mix before they burn. Neither of these conditions is safe, and you should have a professional check your furnace. Fuel sediments can cause an oil furnace to make a sputtering sound. Run a separate line with separate filters and shutoffs to each burner. Do not run your burners for an hour after an oil delivery so the sediments have a chance to settle. If you hear a high-pitched squealing sound, remove the bottom furnace panel and run the blower to see whether that's what is making the noise. If the squealing stops, the noise may be coming from an air leak. Return the panel, go upstairs and listen through your vent. If the squealing subsides as you slow the blower down or turn it off, check the motor of the combustion air blower. If that's not the problem, check the plenum, or chamber that returns the air. A whining noise in an oil furnace is a sign of bad bearings in the draft inducer motor. A loud "whomp" when your oil furnace starts means the burner is not installed properly and the mixture of air to fuel is incorrect. This situation can be dangerous, and you should have a professional check it as soon as possible. If you hear a loud explosion when your oil furnace starts, you have a weak transformer or the nozzle is clogged.